The beautiful spring flowers, moving in rhythm and being carried by the wind, welcomed those who participated in the Myeong Flower Festival, and the sounds of fanfare spread throughout the Natural Temple. 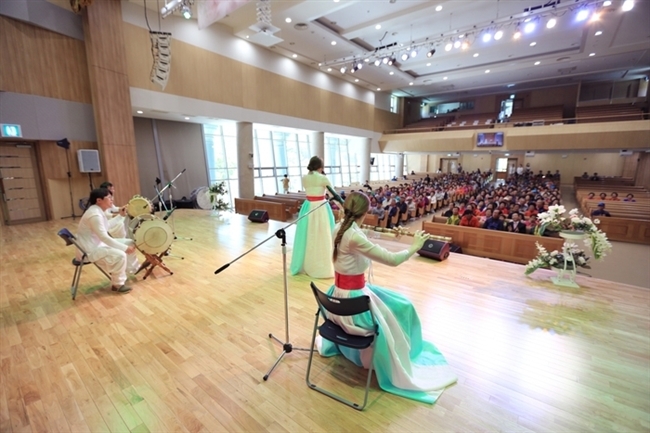 The Christian Gospel Mission (CGM, President: Jeong Myeong Seok) hosted the 2016 Myeong Flower Festival in Wolmyeongdong, the Natural Temple, and it was held between April 30 to May 8. The festival lasted 9 days, and a crowd of 22,000 enjoyed the event. 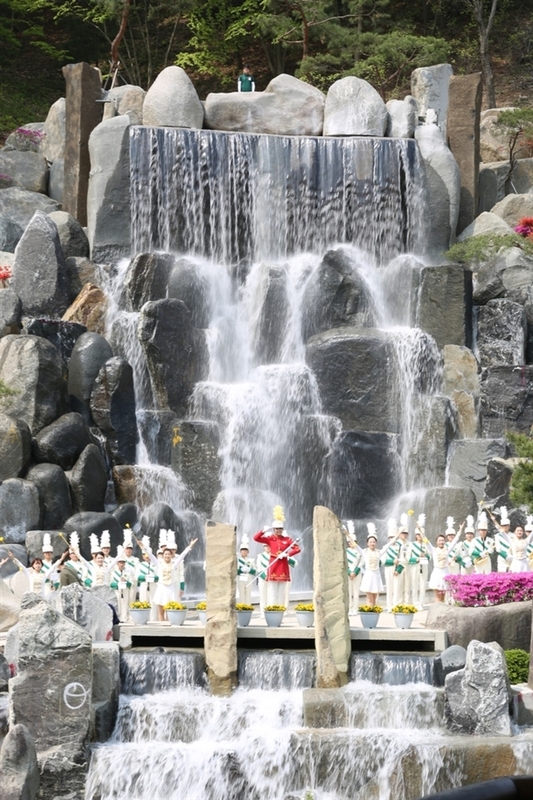 ▲ The sounds of fanfare spread throughout Wolmyeongdong, the Natural Temple, marking the beginning of the festival. This year’s Myeong Flower Festival distinguished itself from the previous festivals by including the local residents of Geumsan in the spring picnic held on May 4 and by having events on the 7th that members could enjoy with their parents. On the 4th, CGM invited the local residents as special guests to the festival. They were from the same birthplace and hometown as President Jeong Myeong Seok--the founder of CGM and an international religious leader. CGM commemorated their hard work as people who have lived protecting their homeland. 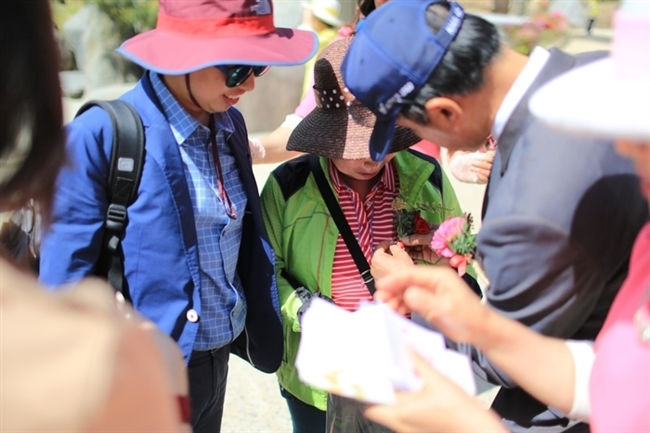 On the 4th, the local residents spent their time pleasantly watching performing arts, enjoying the lunch that CGM had prepared for them, and walking around the Natural Temple, taking in the beautiful scenery. ▲ CGM invites the local residents from where President Jeong Myeong Seok, the founder of CGM, was born and raised in order to commemorate them as special guests who have endeavored to protect their homeland. On the 7th, one day before Parent’s Day in Korea, members of CGM brought their parents to the festival. While walking around, they delighted in seeing the spring flowers that had bloomed in the lush fields, and they also enjoyed the art performances. Additionally, some ate the lunch that CGM had prepared, while others who had brought their own lunches enjoyed them outdoors and formed unforgettable memories with their parents. ▲ Members of CGM participate in the festival with their parents and attach carnations* of love on their parents’ shirts. During the festival, CGM held an exhibition of illustrated poetry, displayed proverbs, held performances, and hosted a variety of other programs. In addition, the fragrance of the flowers that symbolize the beloved ones, and the human flowers together with their parents, filled the Natural Temple. The festival of joy and the praising of God continued for 9 days. God declared in the Bible that He has set eternity in the hearts of man. This year’s Myeong Flower Festival was an event, overflowing with the fragrance of love from believers who were able to realize the noble providence of divinity and who were able to steadily go towards the eternal world of Heaven, along with all who were invited to that world.